Yiannis is a unique artist in the World-Instrumental, Musical Genre. Award-winning multi-instrumentalist, Yiannis Kapoulas is an artist that continues to break new ground with his infectious blend of ethno-fusion, World Instrumentals, a unique sound that runs the gamut of influences from Latin, Mediterranean, Middle Eastern, Jazz, Classical and Funk. Yiannis performs a multitude of exotic stringed instruments with agility, speed, precision and a passion that has been awing music fans at countless concerts, festivals and performances across Canada since his debut Canadian release of his debut self-titled CD in 2010. 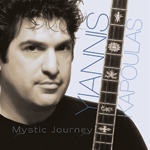 Yiannis has since released his sophomore CD titled Mystic Journey documenting his musical journey with his signature, exotic, international sounds and instruments. Yiannis features his two signature instruments, the Ethno III Electric and the Ethno III Acoustic on both his CDs.